Totalling some 200 square kilometres, Nusa Penida is much larger than the better known Nusa Lembongan. However, tourist infrastructure is very limited here but growing fast. 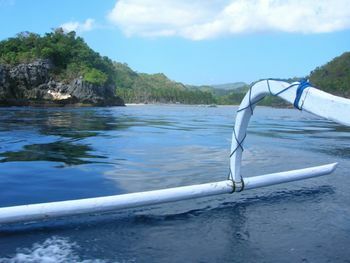 Due to a lack of natural fresh water, little is grown or produced on Nusa Penida, and even some basic foodstuffs come in by boat - which increases the cost of produces. Visitors should therefore expect higher prices than in Bali, and not bank on any tourism-related luxury items being available for purchase here. Nusa Penida has also become an unofficial bird sanctuary for endangered Balinese and Indonesian bird species, including the critically endangered Bali Starling (Leucopsar rothschildi). In 2004 theFriends of the National Park Foundation (FNPF) started an introduction program onto Nusa Penida of the near-extinct Bali Starling. Over 2 years from 2006, 64 birds were released into the wild. By the spring of 2009, 58 chicks had successfully hatched in the wild and in 2010 there were estimated to be over 100 birds. As with many similar release bird projects in the West Bali National Park that have failed because of poachers, this has been a bit more successful in preventing the Bali Starling from becoming extinct. The local Nusa Penida population actively protects the birds. In 2006 all villages unanimously passed a local regulation making it an offence to steal or threaten the life of the birds. There are public boats from Sanur, Kusamba or Padang Bai in East Bali. You can catch the daily public ferry (large boat that includes vehicles) at 11:00 am. This departure time appears to change from time to time, so best to confirm. This trip is said to take around 2 hours. A passenger ticket is Rp 31,000 each way and can be purchased at 10:00 am inside the building marked "Loket". To bring your own motorbike costs an additional Rp 50,000 and is purchased at the gate as you drive up. This ferry arrives in Sampalan at the Sampalan Ferry Terminal on the North-East corner of the island, just off of the main road. This is a preferable way to get to and from Nusa Penida. The boat is fairly stable on the water, and it affords you great views, bathrooms, and the ability to walk around the boat and stretch. There is also a smaller private speed boat service that typically carries up to 20 people. This departs from Padang Bai beach side every morning. You should be at the beach side by 06:30 to catch the public speed boat. Buy ticket from ticket office near beach and then wait until the boat has enough passengers for the boat to depart. The ticket cost is Rp 45,000 each way if you are Indonesian. If you are from abroad, they will ask you for 75,000 Rp or show the way to the public ferry. This smaller boat requires walking thigh deep in water and being packed into a boat like sardines. It's fast but not really as comfortable as the less expensive ferry. Giliferries.com is one the best and most trusted online booking website for fast boats to Nusa Penida. They offer the best price-quality ratio and all tickets include free hotel pickup and drop (Bali only). They only work with the most trusted and reliable boat operators. Prices start from as low as $15 one way and $30 for return, depending on the season. Giliferries is the only site which offers live availability, instant confirmation and e-tickets directly in your email. Unlike most other booking sites, there is no difference in pricing between foreigners and domestic customers. Gangga Express operates several speed boats a day from Pelabuhan Tribuana in Kusamba. Price for foreigners is Rp 100,000 each way and takes about 30 mins. There is a daily public boat between Pelabuhan Tradisional in Sampalan and a port next to Pelabuhan Tribuana in Kusamba. Leaves Sampalan at around 6 am and probably goes straight back after reaching Kusamba. Price is Rp 45,000 and takes 45 mins. Patagonia Xpress is one of the best and safest fast boat from Bali to Nusa Penida that runs on a daily schedule. They offer free pickup service and a half day/day tour around Nusa Penida and Nusa Lembongan. Average price is around Rp 550,000 per person. Quicksilver runs daily cruises from Benoa Harbour in Bali to their monstrous pontoon which floats off the north western shore of Nusa Penida. The trip includes water sport activities centred on the pontoon. Rp 570,000 per person. Public boats depart daily at 06:00 close to the suspension bridge between Nusa Lembongan and Nusa Ceningan and run to Toyapakeh or Buyuk Harbour in northern Nusa Penida. There are also services from the Jungut Batu area of Nusa Lembongan to Nusa Penida. All of these can be a little 'worrying' at times and are often very crowded. A "ferry" runs (at least in high season) from the lembongan side of the yellow bridge during the day approx. every 20-30 mins to penida. Ticket one way is 60.000 IDR. Last boat penida - lembongan leaves at 5 pm. We were on the 4:30 boat and had space left for maybe 5 more people. Was small boat with capacity of approx. 20 people. Reasonably ok, calm sea. On the harbour in penida you can rent a scooter at 60-80 k per day. Charter boats are available, departing from and arriving at the same area as the public boats. If you are staying on Nusa Lembongan, ask at your hotel. If not, go to the shoreline close to the suspension bridge or to the beach at Jungut Batu and ask around amongst the boatmen. Rates certainly vary but expect to pay around Rp 300,000. Renting a motorcycle is the most practical option, and this will cost you about Rp 60,000. Look for outlets in Toyopakeh and Sampalan (or more likely, they will find you!) You may be able to find a rental car but they are not common and not recommended as the roads to as good as every spot worth seeing are very rough and small. Some visitors from Nusa Lembongan arrive with rented pushbikes - make sure you get permission to take the bike off Nusa Lembongan first. You should note that roads in Nusa Penida are rough, hilly away from the north coast, and in remote areas no more than stone-strewn tracks. Local public transport is in small old bemos or on the back of a truck. These vehicles ply the north coast road with some regularity, but elsewhere on the island do not bank on anything. Take note that it is recommended not to plan too much in one day, although the distances might not seem so big. For a less experienced scooter driver the conditions of the road allow an average of 25-35 km/h. Be sure to get your tank full before leaving into the hills. Fuel uses quickly in this rough conditions! There are many quiet and secluded white sand beaches along the north and northwest coasts of Nusa Penida. Other geographical highlights include limestone caves, spectacular high coastal cliffs with karst formations and offshore pinnacles in the south and east, and rugged hill tops in the high centre. Nusa Penida has several interesting Hindu temples. When visiting be respectful and always heed local advice. This is a wild, rugged and largely untamed island which offers plenty to those with an adventurous spirit. It is highly recommended to spend more time here and see fewer sites each day. Travel is extremely slow between each site and the road conditions are very poor. Cruise Tours. Private beach cruise to Crystal Bay and go through a real Balinese Island experience. The Castaway experience is a complete haven of relaxation. Guided Tours. Numerous local tour operators have popped up with the increase in tourism. They are all locally owned and operated and most have quite good english skills. They provide island tours, snorkelling tours and bird watching tours. They operate boats and also conduct scooter or car tours. Trekking and mountain-biking are rewarding with amazing coastline views. The terrain away from the coast is hilly rising to nearly 524m and the vista back to Bali is stunning. The island covers just over 200km sq. Absorb the culture. The native people are Hindu as in Bali but the language spoken is an ancient dialect of Balinese called Nusa Penidan. The architecture and dance is also distinct. Toyapakeh is a predominantly Muslim inhabited village near the harbour. Birdwatchers who find themselves with the opportunity to visit Nusa Penida should know that a thriving population of the superb white-tailed tropicbirds breeds on the south and southeastern cliffs of the island. Keep your eyes peeled. Nusa Penida has been designated an island-wide bird sanctuary by Friends of the National Parks Foundation (FNPF). Various endangered Indonesian bird species have been released onto the island, including the Bali Starling, Java Sparrow, Mitchell's Lorrikeet, Lesser Sulphur Crested Cockatoo. Snorkeling. Good snorkeling is available in most places along the coastal road, since the edge of the reef is not far from shore. Easiest access is usually in places, where locals keep their fishing boats. Due to the currents along the coast, walk back along the road to the starting place may be necessary. Ped, Toyapakeh, Crystal Bay (if not too windy) and Gamat Bay are fantastic for snorkellers and can be accessed from land. You can hire snorkel equipment in Crystal Bay quite cheaply. If you want to snorkel with giant mantas you will need to take a snorkel tour on a boat, these leave from Toyapakeh mostly. Freediving. 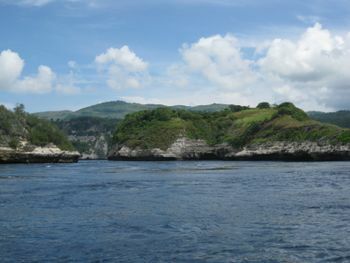 Nusa Penida is one of the best place around Bali to do freediving. Conditions for freediving are perfect here: visibility stays on the high level all year round, water temperature is around 27-29 C. There are plenty of interesting dive sites around the island suitable for freedivers, possibility to freedive with Manta Rays and even underwater cave near Crystal Bay. Just be aware about the current. It can be really strong! There is only one freediving school on the island. Diving. 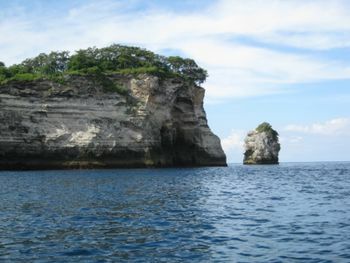 Nusa Penida is best known as a world class diving destination. There are more than 20 identified dive sites around the island, the most notable including Crystal Bay, Manta Point, Manta Bay, Toyapakeh, Gamat Bay, Ped and SD. The rich waters around the three islands support no less than 247 species of coral and 562 species of fish. Many dive operators based in Bali and neighbouring Nusa Lembongan offer specific dive trips to Nusa Penida. Special attractions include fabulous Mola Mola (Oceanic Sunfish) in season (July-November) and large Manta Rays year round. Mola Mola are migratory fish and most likely from July to October although sightings are reported all year round. There is diving available here for beginners but most of the dives require a decent level of experience as currents are strong and unpredictable. 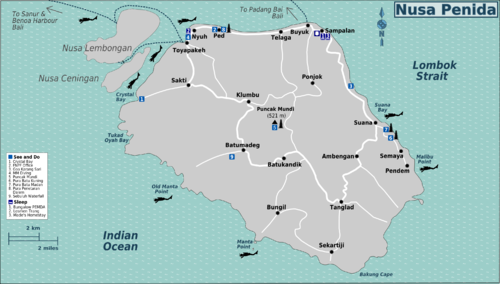 Nusa Penida has five dive centres: Nusa Scuba Diver, Blue Corner Dive Penida, Nusapenida Watersport, Octopus Dive and Penida Dive Resort. There are two (blue) ATMs for Bank Rakyat Indonesia (BRI) in Sampalan and Toyapakeh which accept Visa and MasterCard Debit cards. Toyapakeh is a more temperamental one and does not work for most cards most of the time. Sampalan has a different ATM machine type that does work. There are two more (green) ATMs for a Balinese bank in Sampalan and Ped, however, these do not work with foreign ATM cards. To be sure you may want to bring enough rupiah with you just in case the BRI ATMs are out of order/out of cash/out of their mind. Sampalan has a couple of minimarkets for buying local snack foods, toiletries, washing powder, clothes, footwear, hardware, ice creams etc as does Toyapakeh. Both these towns have morning markets to buy fruit, vegetables, snacks, fabric, clothes, bags etc; Sampalan being more extensive. The Gallery near Ped Temple is run by Mike, they serve food and also has a small shop specialising in locally produced goods. Mike speaks Bahasa Indonesia and has lived on the island for a few years, he loves a chat and is a wealth of information. There are simple local warungs on Nusa Penida and few western style restaurants to speak of. Don't expect Bali extravagance here, you will get traditional Indonesian meals. Warung Duur Billabong as its name, located right above Angel's Billabong. It serves a variety of western dishes at reasonable prices and the whole coconut is an all-time-favorite. Not to mention, it has a magnificent view of the Billabong overlooking the Bali Sea. Sun Sun is a new place to eat which is worth a visit in nusa penida, location is on the edge of the beach, in ped village, you can find it in google maps. the place is comfortable and quiet. romantic place for couples, you can see the island of bali and lombok island and see the beauty of Agung mountain.there provides a good indonesian food, italian food and seafood such as shrimp, squid, fish and beverages such as fresh juice, soft drinks, cocktails, and traditional blends of bali alcohol. food frices are pretty cheap.open starting 05.00 PM. The Gallery in Ped, owned by Mike, he serves western dishes including vegan and gluten free, he serves fresh juices and filter coffee and prices are very reasonable. He also has a small shop specialising in all things locally produced on the island. Wayan's Warung, located on the beach-side in Ped village is popular with visitors for its fresh, foreigner-friendly dishes. Warung Pondok, near Ring Sameton Inn, has a good range of Indonesian food and a bar, with fantastic sunset views. Ring Sameton Inn's restaurant produces fresh local meals and juices. Sampalan has several good roadside warungs and the night-market serves up siomai and bakso. Ulam Segara in Sampalan is the most upmarket Indonesian restaurant on the island. Depot Anda Warung offers another tasty range of meals, busy with the locals and take aways. QFC (Queen Fried Chicken) in Sampalan for everything deep fried and popular with the locals for their amazing range of juices. Try fresh-caught fish for a real taste of Penida. On the beach front at Toyapakeh there are two very small restaurants (Restu Toyapakeh & Warung Makan) serving simple and good Indonesian food. It makes for a good spot to catch sunset. Jungle Warung is best found before the sun goes down, but worth it; a white sign, on the road to Crystal Bay from Toyapakeh, starts the journey through small villages and a tiny track into the jungle for excellent fresh fish, prawns, calamari barbecued over coconut husk grill. Crystal Bay has numerous warungs and a newly established cafe. Remember to take plenty of water on board. The climate here is hotter and drier than in Bali and you will dehydrate quickly. There are various types of accommodation in Nusa penida, depending on your budget. These are mainly located in the north between Toyapakeh and Sampalan. Visitors to the island often do not book ahead and instead turn up and take their chances, with tourism demands exceeding supply this can be a problem especially in the high season between July - September. Visitors wishing to explore the remote, rugged areas of the island in the high centre and south may be able to find informal accommodation with a local family by asking a head of village (Kepala Desa). There is no onward direct service to Lombok or other points east, however there is one daily service from nearby Nusa Lembongan to Gili Islands via Lombok operated by Scoot Fast Cruises. This page was last edited on 16 March 2019, at 16:33.